With the explosion of online shopping across the globe, taking your service or product on the internet is always going to be a wise move. For that, you'll need an eCommerce-enabled website. If you're offering multiple products, a shopping cart feature should be part of your online store. To build a secure and user-friendly eCommerce website, you'll need a specialized software solution. Fortunately, there are several free and powerful shopping cart applications one can use to power his online store. I've carefully handpicked some of the eCommerce solutions most of which are standalone bundles capable of running independently without any reliance on a parent content management system. Though all of the listed eCommerce applications below are free-to-use you'll still need a web hosting server to run such type of software. If you're looking to create your very own online store, look no further and try out these popular shopping cart solutions to give a boost to your business. Try them initially in a private test environment. If you're already running your website on a content management system like WordPress or Drupal, take advantage of the eCommerce extensions (plugins) available for the respective CMS. And now, let's get started and check out some of the best and free eCommerce solutions. OpenCart - We'll start with one of the most popular open-source shopping cart solutions having a good user base. The self-hosted bundle doesn't impose any kind of restrictions and one can exploit all the features to the full extent. I loved its reporting dashboard packed with lots of useful conversion statistics. If you're going to run a large online store, it also has a full-fledged user management system to delegate responsibilities to the team members. It has a rich set of privileges and access controls for the users. If you want to run multiple online stores selling different types of products, you don't need to install multiple instances of this application. A single running instance is flexible and powerful enough to run multiple online stores, seamlessly. It has an affiliate system to give a boost to the eCommerce site. CubeCart - This feature-packed shopping cart software is not only free but is open source too. It has a rich archive of knowledgebase and video tutorials to help new users get started with minimum hassle. It also has one of the largest collection of extensions to add new features and functionalities, with ease. To boost your sales, it includes both gift certificate and coupon code systems to run successful seasonal marketing campaigns. The application's installation process is quite simple without any complexities. All the Google Analytics eCommerce settings are baked right inside the software so that you can get detailed conversion statistics in your GA dashboard. This application also generates different types of log reports to help you analyze performance and problems. I loved its built-in advanced caching support. 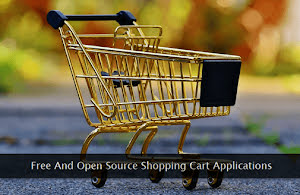 X-Cart - This free and open source eCommerce software is an excellent option both for new as well as seasoned players. It has a collection of carefully crafted responsive storefront themes to match with your design preferences. It's a multilingual solution to sell products across the globe in different languages. It has a powerful email marketing module one can use to salvage potential purchases from abandoned carts. Social buttons for product review and rating are tightly integrated with all the storefront themes. The entire online store is served in a search engine friendly format to ensure your products are displayed in the best possible way in the search results. For buyers' convenience, a good number of popular and flexible payment gateways are supported, out-of-the-box. Developers can extend it through an API. LiteCart - As the name suggests, this is one of the lightest shopping cart applications capable of running smoothly even on low-end servers. Due to less resource usage and optimized code, it runs blazingly fast. It also happens due to the dynamic loading of the modules, whenever they're required on the front end. The admin interface enables you to create custom information pages which can be used in the purchase process pipeline. The different tax structures of all the popular economic zones are fully supported too. It has a range of configurable automated actions one can use to optimize the conversion funnel. It also provides an option to create multiple background jobs which can run at scheduled intervals to perform critical store-related tasks. All the regional customers can easily select the local currency and language. AbanteCart - This is yet another open source shopping cart software one can use to create a stable and user-friendly eCommerce store. Both the desktop and mobile versions are fully search engine optimized to ensure a good presence in the search results. Its admin interface can be quite easily voice controlled. It has a feature-packed and flexible API developers can use to enhance the store's functionality. It is also best suited to sell digital products and services. Administrators can also create custom pages and layouts. Product pages can also be printed in a user-friendly format. One can also enable SMS notifications to get instant alerts of key events happening on the online store. It supports a wide range of shipping options for the physical products. Data migration and import from popular shopping carts are also supported. ZeusCart - This free eCommerce software is powered by Twitter Bootstrap Framework which makes the administrative interface very user friendly and responsive. Both digital and physical products can be sold through this solution. Each category of products can be given multiple attributes for flexible segregation. A slideshow of products can also be created to better display the offers to the potential customers. Select products can be featured on the key pages of the store. New products can be automatically displayed. It also has a powerful search functionality which enables the customers to find the products on the basis of keywords and categories. Apart from regular online payment methods, a cash on delivery option can also be enabled. It also has an excellent wishlist feature to let the customers save their favorite products. Arastta - Do once try this open source eCommerce software. It has a flexible theme customizer to easily create and modify designs without messing with code. It provides all the standard security features like SSL and captcha codes. The creation process of custom product menus is dead simple even for a layman. The Ajax-powered search system finds and lists the products without reloading the page. Customers can also download their invoices in a PDF format. Showcasing products on a Facebook page is simple too. The created online store can be multilingual too if required. The graphical analytics data makes the analysis of the store's performance easy for the administrators. It has rich import and export options to save and transfer your store's vital customer data. All the files can be managed directly from the dashboard. nopCommerce - This eCommerce application is free-to-use and is powered by ASP.NET technology. One only needs to retain the copyright link in the footer to use this software without any restrictions. The pluggable module architecture of this shopping cart app enables addition of new features, dynamically. It has a reward point and an affiliate system for both potential and existing customers. It also has support for RTL languages right within the core. Customer accounts can be fine-tuned through custom privileges. For stores having a large inventory, this application also supports bulk editing of product information to save time. eCommerce related microdata ensures your store is fully accessible by search engines. It has one of the simplest admin interfaces to easily configure and manage the online store without any hassle. Magento Open Source - The open source community edition of this popular eCommerce platform is a must try option for every store owner. It offers beautiful and responsive themes to quickly build an online store in no time. A collection of useful plugins adds more power to this eCommerce platform. It has a large community of both the developers and users which ensures the platform is updated and improved on a regular basis. Once running well, a business can also upgrade to the premium edition. The detailed user documentation is available both in HTML and PDF formats. If you get stuck anywhere or need some help, its active forums are a perfect destination to resolve the issues. A good number of big brands and companies are using this eCommerce solution which itself tells about its growing popularity. PrestaShop - This list will be incomplete if this user friendly and powerful shopping cart application is not mentioned. With lots of filtering, sorting, and layout options one can arrange and present all the products in the desired format. A product search functionality can also be included on 404 pages, easily. It generates rich and insightful sales data to track performance as well as to optimize the existing setup. One can create multiple (local & international) shopping stores from a single software copy, easily. Both small and big inventories can be easily maintained through this solution. This store's internal search engine can be customized as per the business needs. If you also have physical shopping stores, display their locations prominently on the map to let the customers know the exact place in their locality. Spree - This actively-developed and open source eCommerce software is definitely worth trying. It's built using Ruby on Rails and is best suited for developers and for all those people who're technically sound. I loved its excellent product cloning feature which ensures the quick creation of a similar type of products. It supports dozens of payment gateways giving enough flexibility to the customers to easily pay in their preferred way. The detailed user documentation enables easy configuration of a brand new online store. During the festive season, one can run highly customized promotional campaigns to give a boost to the sales. With dozens of free extensions, the addition of new features to the store is not a big ask. Its minimal and clutter-free interface is a big boon for general users who can easily manage the entire store. WooCommerce - It's not possible that we talk about eCommerce and do not mention this hugely popular solution. If you're running a self-hosted WordPress site, this shopping cart platform is undoubtedly your best bet. It has a large community of developers who actively work on this platform on a consistent basis. Users can also choose from hundreds of extensions making it one of the most extensible eCommerce applications available on the internet. The same goes for themes which are available in abundance. Its customer's geo-location auto-detection feature ensures the platform is correctly calculating the shipping costs. The same applies to the calculation of tax rates too which are processed on the basis of shipping address. Pre-built email templates enable you to send beautiful notifications to the customers.